You are at:Home»Life Issues & Bioethics»Contraception & Abortion»Pro-Life Advocacy – It Might be Easier Than You Think! Abortion is a scourge on our nation, yet there are millions of faithful pro-life citizens across the land. Recent statistics have shown that, even after the reelection of the most rabidly pro-abortion president in history, our nation remains firmly in the corner of Life. In fact, the numbers of those who are pro-life are on the rise. Yet there is much frustration among the faithful. The recent mass carnage at an elementary school in Newtown, CT illustrates the duplicity exhibited by our government, when it comes to the value of Life. In an address concerning this horrific event, President Obama spoke these words. “If there’s even one step we can take to save a child, then surely we have an obligation to try. The irony of Obama’s obtuse statement didn’t escape the millions of citizens who honor the sanctity of all Life – in fact it further fueled their frustration. Yet this is exactly what we are up against and why we must solidify our efforts. There are legions of us and together we can be the difference that swings our country back to a Culture of Life. So why is it that so few people seem to be willing to fully commit to the issue? That is a question I ponder daily. Each new day finds me doing my best to focus on my Catholic faith and, by extension, furthering the pro-life movement. I’m quite bold about my positions on both counts and it would be difficult to mistake where I stand. Consequently there are also many like-minded people in my life – both locally and across the nation. Yet much pro-life advocacy support comes in private. I find that many people are still hesitant to take a strong public stand. Although I receive countless private messages of encouragement and agreement, I find that public support is somewhat timid. Write a Letter to the Editor to your local newspaper. This is a good effort to get the conversation started in your community. You don’t have to be a columnist to put together a heartfelt 200 words or so, in support of the Culture of Life. Many like minded souls out there will find kinship and encouragement from your words. Attend the annual Mass for Life in your parish or diocese. Attend your local Life Chain in October each year. 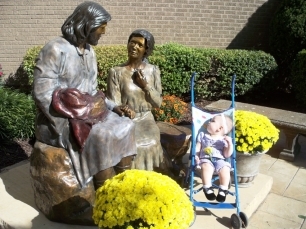 Is there a Roe vs. Wade Commemoration planned in your community? Your presence is more important than you might think – to others and to you. ‘Like’ and ‘Share’ pro-life memes and stories via Facebook or email. Make an effort to do this often, even if it feels redundant or pointless. Helping pro-life groups keep their analytical numbers up is much more important than you may realize. Think and speak with a pro-life heart. 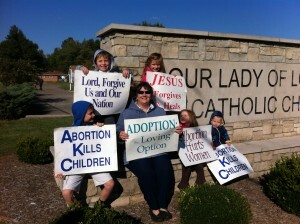 It’s amazing how much difference each of us can make when we inject of bit of pro-life dialog into our daily contacts. Pray for the pro-life movement, mothers, fathers, and babies daily. Do this with your family to help stimulate their awareness. This will bleed over into their thoughts and actions – sometimes when least expected. Encourage your parish to use pro-life intentions at every Mass and for your priests to use theresources available through Priests for Life for ongoing educational efforts on behalf of Life. Keep abreast of Life issues as they evolve. This can be easily done through pro-life Facebook pages and websites. Keep it classy. Our old friend, Sparky, doesn’t like it when the people of God show a unified front. There are some areas where good pro-life people might disagree – especially in methodology, but fight the urge to use your, ahem, ‘talens’ of sarcasm and keep the acid tongue at bay. There are more genteel ways to communicate our differences. We are much more powerful when we are united and respectful of one another. 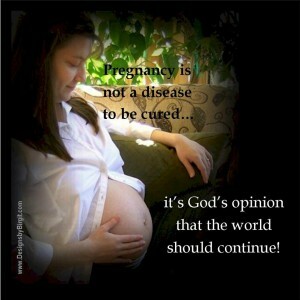 Join your local right to life group or pregnancy care center. Consider board membership or volunteering for a special event. Attend the Annual March for Life in Washington D.C.
Plan a rally or demonstration when you see an opportunity. Commit to praying in front of an abortion mill – you’ll never feel the same again! Start a campaign to erect a pro-life statue at a local university or a memorial for the unborn at your parish or cemetery. Use your God-given talents for the pro-life movement. For example, my hunger for an artistic outlet is satisfied by using photos of my children, grandchildren and the children of friends to create pro-life memes that are then shared at Pro-life Designs by Birgit. These are my little efforts to tug at the heartstrings of others in an effort to garner more soldiers for the cause of Life. As a longtime pro-life advocate, I have been in this fray from the beginning. My early experience as a14-year-old who became pregnant via assault solidified that. I find this work very rewarding and yet also telling. As we stand on the threshold of the 40th anniversary of the right to kill unborn children – up to the moment of birth – I am keenly aware of the ever present need for education. But, just as in winning of souls to the Kingdom of Jesus, the fact is that this work will never be finished. We are all at different phases in our lives – both in faith and in Life. Patience is a virtue with which I struggle and my frustration is sometimes heightened by my enthusiasm to reach out in order to recruit more soldiers for Life (and therefore Christ). For this reason I find it vital to wrap myself, and my efforts, in prayer. I realize that I am not marching to my own tune. I am not working on my own goal. As our priest recently said during his homily, I am not representing myself. No, I am here as a representative of the Father, and of the Son, and of the Holy Spirit. This is not my struggle. As brothers and sisters in Christ Jesus, it is our struggle. We need each person to participate in order to be effective. With so many ways to join the effort, shouldn’t we all resolve to give our best? We must do it for the babies and for our Master, the Lord Jesus Christ, in Whose Holy Name we walk this earth! St. Maximilian Mary Kolbe, patron of the pro-life movement, pray for us!